The director’s vision of “King Arthur: Legend of the Sword” was presented to San Diego Comic-Con at the Warner Bros. panel on Saturday, and Ritchie’s high-octane sensibilities seemed to agree with the sword in stone. The king himself, “Sons of Anarchy” alum Charlie Hunnam, was on hand to present the first look. Ritchie’s swift, almost-POV camerawork was on display — as was Hunnam’s enviable physique. Hunnam seems much more like a street hustler than royalty in the action flick, but it works to his advantage. Jude Law makes for a compelling villain, with welcome appearances from Djimon Hounsou and Eric Bana. Warner Bros. unleashes the retelling on March 24, 2017 in the U.S.
Away from the convention floor, where credentials carry no sway, Comic-Con parties in San Diego are in full swing. 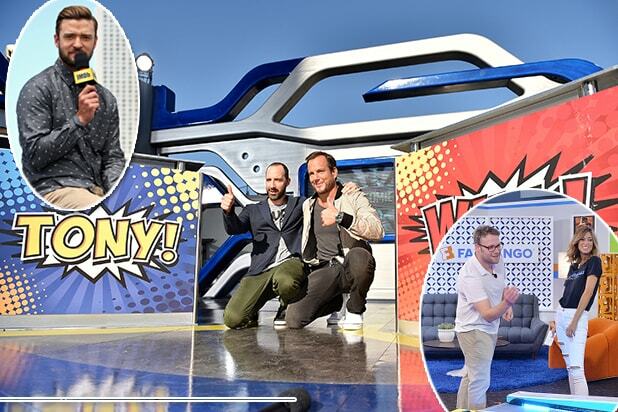 Here, Tony Hale and Will Arnett anchored Syfy's daily show, as Justin Timberlake and Seth Rogen floated through town. Justin Timberlake is arguably the biggest global star at the Con. JT is so famous that he and co-star Anna Kendrick got to keep their shoes on while plugging "Trolls" on the IMDb yacht. Team "Trolls" snapping a selfie in the Convention Hall. From the EW party to Samsung's setup, the Hard Rock was the place to be. Cara Delevingne (left, promoting "Valerian") and "Suicide Squad" castmates Margot Robbie and Will Smith were three of the huge names that added the Samsung Experience to their Saturday schedules, sampling the Gear VR. Svelte Seth Rogen playing Skee Ball with Nikki Novak in Fandango's playroom. "The Walking Dead" cast met Ian, a junior superfan aboard the IMDb yacht. Jeffrey Dean Morgan, Norman Reedus, Andrew Lincoln, and Steven Yeun played "Pokemon Go," rattled off trivia, and tried on Captain's hats with the young Make-A-Wish recipient. "Grimm" star Bree Turner brought a layer of "loud" over "loud" at the bright and splashy entrance to the crown jewel of Comic-Con parties -- Saturday night's Entertainment Weekly bash at Float at the Hard Rock. Inside, this clique had all the gravity: Walton Goggins, Michael Chiklis, and Danny McBride. Goggins, who first broke out next to Chiklis on "The Shield," and the teflon McBride have been on a full throttle promo tour for HBO's "Vice Principals." A superhero's view of the Entertainment Weekly bash. All-time box office king James Cameron (#1 and #2) with Chiklis, who despite the Emmy and Golden Globe wins for TV, has not had a robust feature career beyond the "Fantastic Four" franchise. Phonetic friends: NBC Entertainment Chairman Robert Greenblatt and EW Editor-in-Chief Henry Goldblatt. At NBC's own Comic-Con party at the Andaz, Sullivan Stapleton ("Blindspot") and the always-working Abigail Spencer ("Timeless") spent time with the boss. DJ Michelle Pesce had a super-powered schedule, spinning both MTV's Fandom Awards and the EW bash. At EW, Drake ("Jumpman," "Child's Play") and his rumored girlfriend's "B--ch Better Have My Money" were the artists that filled the floor. How cool is this? "The walking hockey jersey," Kevin Smith, hosted IMDb's interview yacht. Here, he chopped it up with "The Walking Dead" stars Cliff Curtis and Kim Dickens. Before hosting the bash of the weekend, EW's Jess Cagle (center) planted a flag at the brand's Sirius radio channel studio daily live broadcasts. John Stamos and Taylor Lautner are both headed for "Scream Queens" Season 2. Hannah Marks, writer Max Landis and Elijah Wood are working on the BBC America comedic thriller "Dirk Gently," an adaptation of a popular series of novels. A year to the day before "Valerian" opens, Cara Delevingne and Dane DeHaan (in matching shoes) snuck off to the Wired Cafe on Thursday, Hollywood's hidewaway from convention riff-raff. At left, director Luc Besson and, at right, Wired host-publisher Kim Kelleher. Wilmer Valderrama stripped down to reveal a piece from the Will Arnett collection at Syfy's live daily show. Thursday night's hot party was Nylon at Omnia, the San Diego outpost of the Vegas hotspot home to Calvin Harris, Chuckie and other big DJs. At Comic-Con, "Game of Thrones" actor Kristian Nairn (Hodor) spun the party, rebranding his set as "Rave of Thrones." Most were not on the list: Thursday night's Nylon party. Since the late 1990's, DMX's cartoonish -- and periodically tragic -- "highs" and lows bestow a flavor of enduring superhero credibility that make him a perfect fit to play a Comic-Con party. On the day that Tyler Posey and MTV announced that their "Teen Wolf" will end after the upcoming Season 6, Posey was in fine spirits, fashioning a lightsaber at Nylon. Knxledge rode "the bus," chumming up with fellow delegate from hip-hop nation, Action Bronson. Keen eyes will spy producer The Alchemist in the background of Viceland's spectacle. Branded activations are alive and well. As the industry keeps pushing Troye Sivan towards stardom, one candy company is sweet on him, too. He sold out Wednesday's show within five minutes of tweeting about it.